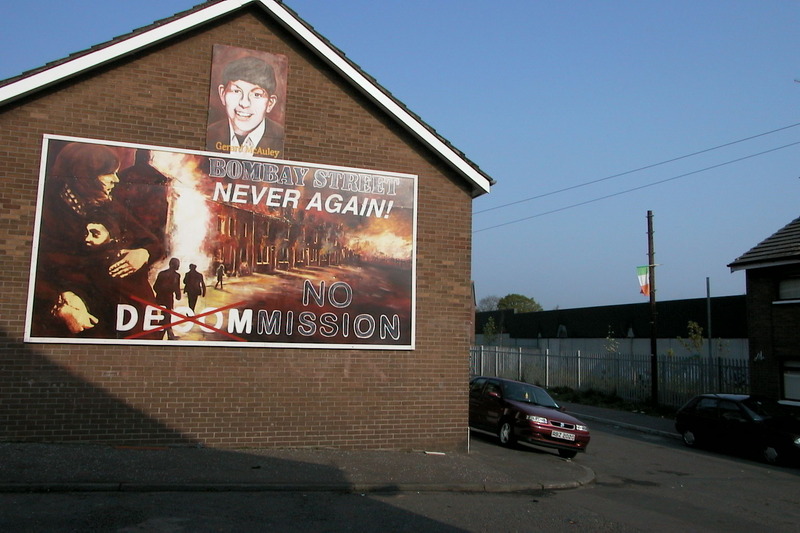 A painting of the scene in Bombay Street during the burnings of August 1969 with a reference to the issue of decommissioning of paramilitary weapons is fixed to a gable wall in present day Bombay Street. The old Bombay Street was destroyed by fire during attacks by Protestant mobs on 15 August 1969. The person in the top painting is Gerald McAuley (15) who was shot dead by a Protestant gunman during the attack. McAuley was a member of Fianna Eireann, the youth section of the IRA, and is considered to be the first Republican activist to be killed during the current 'Troubles'.